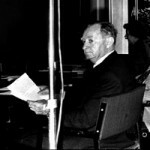 In 1985, on the occasion of the 85th birthday of its honorary president Dr. h.c. Hermann Kesten, the PEN Centre of the Federal Republic of Germany awarded its first Hermann Kesten Medal for outstanding efforts in support of persecuted writers according to the principles of the Charter of PEN International. Until 1993, the Medal was awarded every two years, since 1994 it has been awarded annually. For the first time in 2000, the Hessian Ministry for Science and the Arts has endowed the Medal with prize money of Euro 10.000. The Hermann Kesten Medal was renamed Hermann Kesten Award in 2008. Hermann Kesten, born in 1900 in the district of Tarnopol near the Eastern border of the former Austrian crown land of Galicia, emigrated to France in 1933. In 1940, as Nazi troops were advancing, he fled to the USA. There – with Thomas Mann – he became active in the “Emergency Rescue Committee” for German-speaking writers, many of whom owed their escape from Europe, even their deliverance from the hands of the Gestapo, to his untiring involvement. He managed to procure emergency visas, money for passages across the Atlantic, and the affidavits prerequisite for entry into the USA. Numerous petitions and thank-you letters by prominent expatriate authors, documented in a collection titled “German Literature in Exile” (ed. by H. Kesten), attest to his efforts.